2018 NC Brewers Cup - Results Here! MOCKSVILLE, NC -- The 2018 NC Brewers Cup featured the stiffest competition yet in the event’s seven year history, with seventy-six North Carolina breweries competing for medals over 2 days of judging. 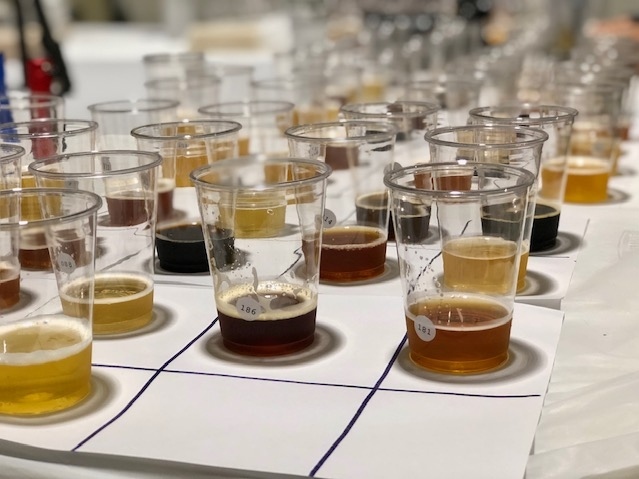 Certified beer judges from across the Southeast traveled to the competition to select the finest examples of each beer style from the 624 entries submitted by professional brewers across the state. Held at Pro Refrigeration in Mocksville, NC, the NC Brewers Cup is the official beer competition of the North Carolina State Fair and the North Carolina Craft Brewers Guild, and is a sanctioned Beer Judge Certification Program (BJCP) competition. Best in Show went to Archetype Brewing for their “Belgian Strong Ale”, a Trappist style Belgian dark strong ale. Archetype beat out 32 other Gold medal-winning beers to secure the NC Brewers Cup trophy for 2018. Belgian dark strong ales are known for their delicious blend of malt richness, dark fruit flavors, and distinct yeast character. They are a lovely, complex beer, with a smooth drinkability. Served in a snifter glass, Belgian dark strong ales pair well with strong cheeses and roasted fatty, or red, meats. This is also a great beer to complement rich, fruited desserts. Honorable Mention: Brown Truck Brewery - “#47 Fainting Goat Spirits Saison,” a saison brewed with Emulsion Gin by Fainting Goats Spirits. Medalists will be on display in the Education Building at the NC State Fair from October 11-21. Medals will be presented to winners at the annual Awards Banquet held on November 7 at the NC Craft Brewers Conference.